In June 1941 the Axis Powers invaded the Soviet Union, and by September their forces had surrounded Leningrad. The blockade lasted an astonishing 872 days and cost the lives of a million of the city’s people, most of whom died of starvation. 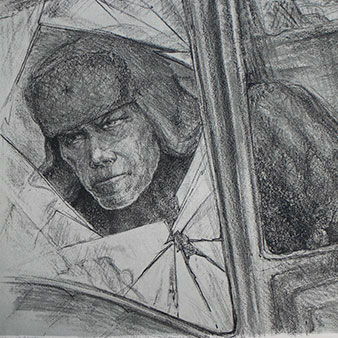 A young artist, Elena Marttila, endured the terrible winter of 1941-42 in Leningrad, and created a visual diary of everything she saw and experienced. After the war she developed her sketches into lithographs and engravings, a selection of which we are showing for the first time in the UK. Elena was determined that her record of life under extreme conditions should be preserved for future generations. 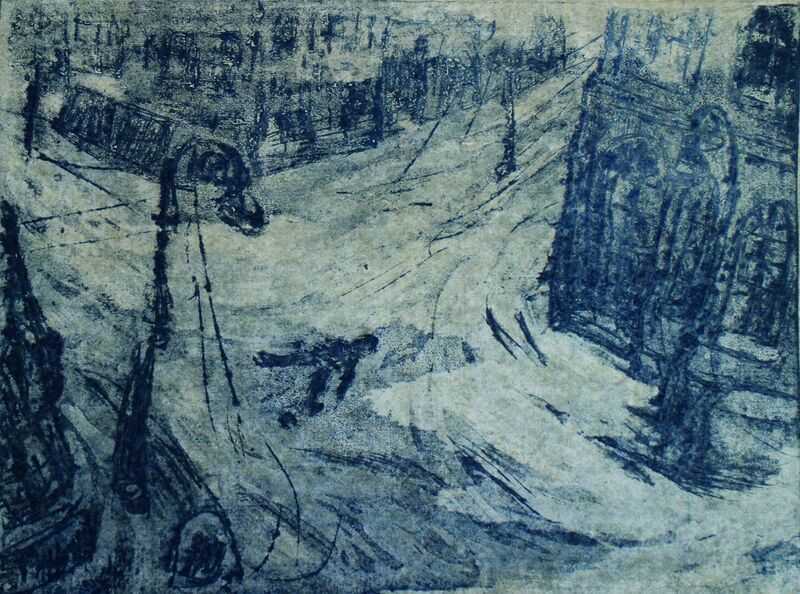 Her work offers modern viewers a unique insight into the darkness that Leningrad endured. 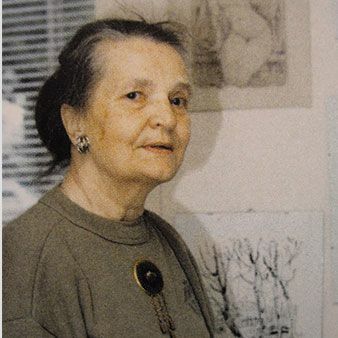 The exhibition is a tribute to Elena Marttila’s life, legacy and artistic integrity and is dedicated to her friends and fellow Leningraders: both those who died during the blockade, and those who survived but are no longer with us. The siege of Leningrad was one of the most terrible events in the annals of World War II. For 872 days the city was surrounded by the Axis forces and cut off from vital supplies – food, electricity and water – as well as from all sources of information. The people of Leningrad endured the most extreme conditions, particularly during the appalling winter of 1941–2. They were subjected to unremitting bombing and shelling, death was a constant presence, and the loss of life in the siege – a million inhabitants – was immense. There was a remarkable witness in the midst of all this human catastrophe – an 18-year-old art student, Elena Marttila, whose work is celebrated in this exhibition. Elena continued to draw in the most difficult conditions and with whatever materials were to hand. 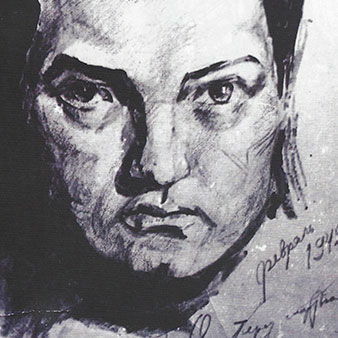 This exhibition includes her portraits of famous figures – Olga Berggolts, the poet and writer, for example, whose radio broadcasts helped keep up the people’s spirits, and Dmitry Shostakovich, sketched at the 1944 performance of his Leningrad Symphony. However, it is her record of the lives of the ordinary people of Leningrad that is most remarkable and moving. She shows us a musician dragging his cello on a sledge to one of the concerts that continued against all the odds, the truck driver who evacuated children across Lake Ladoga, and the bodies of those who had collapsed from hunger and exhaustion in the snow. 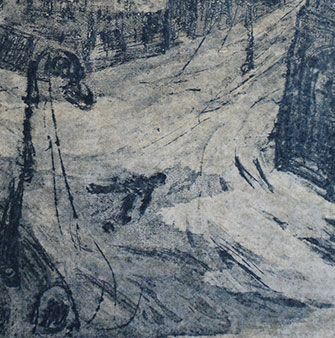 Elena’s vision of the siege of Leningrad conflicted with the heroic narrative promoted by the authorities, and after the war she was ordered to destroy her work. However, she was determined to preserve it as a testimony for future generations. 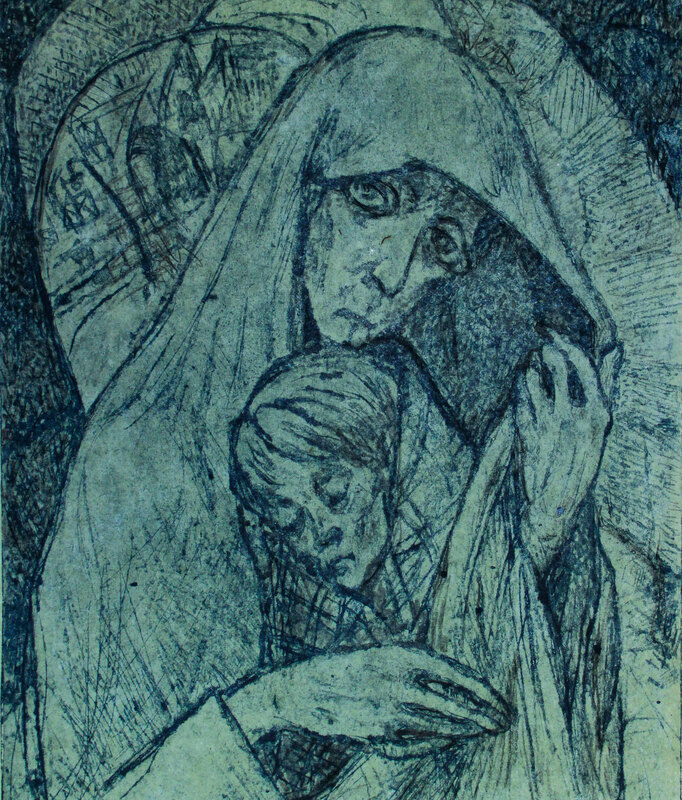 She worked up her rapid sketches into full images using lithography and engraving on cardboard, vividly recreating the blurred sight that afflicted Leningrad’s malnourished inhabitants through her unique printmaking techniques. 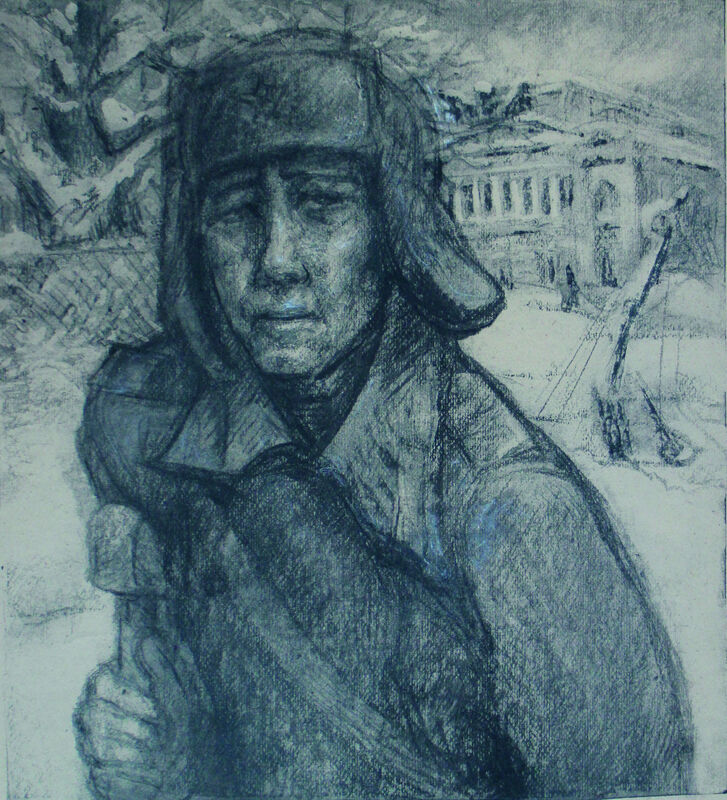 Marttila’s art allows us to see the siege of Leningrad literally through the eyes of those who endured it. 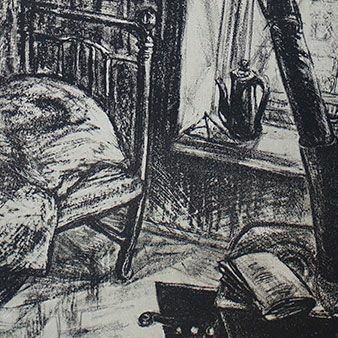 The exhibition will show a selection of her most dramatic lithographs and engravings. Maps showing the disposition of the German forces, the Russian defence, and the famous ‘Road of Life’, extracts from the poetry and music that continued to flourish in the direst conditions, photographs and films of the city under siege, together with a programme of talks and film screenings, will enrich the visitor’s experience by providing a wider cultural and historical context. The siege of Leningrad was lifted on 27 January 1944. Elena Marttila, who will be 94 years old in January, is one of the last living witnesses. This exhibition would not have been possible without her invaluable support and inspiration. It is a tribute to her life, legacy and artistic integrity, and is dedicated to the City of Leningrad, to those whose lives were lost in the blockade, and those who endured it but are no longer with us. The exhibition will take place in Darwin College, Cambridge, from 20 January until 19 March 2017, to coincide with the College’s annual Darwin Lecture Series, which this year is on the linked theme of ‘Extremes’. The exhibition is curated by Ksenia Afonina, an independent curator and researcher into the art of World War II, and Libby Howie, an independent curator with a specialist knowledge of graphic art. The exhibition is hosted by Darwin College and is organised with the support of Sotheby’s and in collaboration with The Cambridge Russian-Speaking Society. 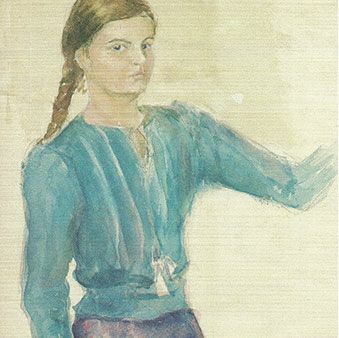 Elena Marttila, an art college graduate, was a gifted young artist, who had already exhibited at the age of eleven. She was eighteen when the war started, and like many other teenagers, worked on digging the defences of the city, and helping in the City’s hospitals. To keep her artistic skills alive, she enrolled in Leningrad’s last functioning art college. In the freezing weather, she developed a working method for her new mission. She would make a rough sketch of anything that interested her, and then fill in the details from memory once she returned to her flat. When, on 8th March 1942, Women’s Day, women began the clean-up, she joined in and, like others, began to feel that there was hope; the city would remain habitable, Hitler would be defied. 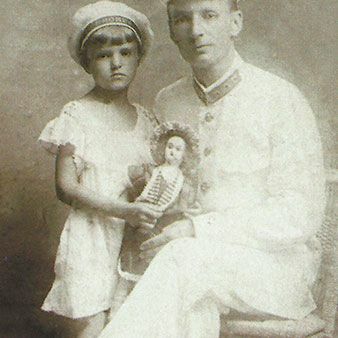 For a while, she was evacuated with her ailing mother across Lake Ladoga to Mordovia, where she worked on a farm, but returned to Leningrad in 1943 to finish her studies. John Barber is a fellow of King's College Cambridge. He is the author of Soviet Historians in Crisis, 1928-32 (Palgrave Macmillan, 1981), co-author (with Mark Harrison) of The Soviet Home Front, 1941-45: A Social and Economic History of the USSR in World War II (Longman, 1991), co-editor (with Mark Harrison) of The Soviet Defence-Industry Complex from Stalin to Khrushchev (Pelgrave Macmillan, 1999) and co-editor (with Andrei Dzeniskevich) of Life and Death in Besieged Leningrad (Pelgrave Macmillan, 2004). Olga Kucherenko is the author of Little Soldiers: How Soviet Children Went to War, 1941-45 (OUP, 2011) and Soviet Street Children and the Second World War: Welfare and Social Control under Stalin (Bloomsbury, 2016). She is currently working on Anglo-Soviet relations in the 1940s. Jeremy Hicks is Reader in Russian Culture and Film at Queen Mary University of London. He is the author of three books and many articles on Russian and Soviet history, film, literature and journalism, the most recent of which is First Films of the Holocaust: Soviet Cinema and the Genocide of the Jews, 1938-46 (Pittsburgh, 2012). Professor Marina Frolova-Walker, University of Cambridge. Professor Katharine Hodgson, University of Exeter. Katherine Hodgson is an Associate Professor in Russian at University of Exeter and the author of: The Twentieth-Century Russian Poetry Canon and Post-Soviet National Identity - with Smith A,, (Peter Lang, 2017), Voicing the Soviet Experience: the Poetry of Olga Berggolts, (British Academy, 2003), Written with the Bayonet: Soviet Russian Poetry of World War Two, (Liverpool, Liverpool University Press, 1996). Reconfiguring the Canon of Twentieth-Century. Dr John Barber, University of Cambridge and Professor Jonathan Wells, UCL. John Barber is a fellow of King's College Cambridge. He is the author of Soviet Historians in Crisis, 1928-32, co-author (with Mark Harrison) of The Soviet Home Front, 1941-45: A Social and Economic History of the USSR in World War II (Longman, 1991), co-editor (with Mark Harrison) of The Soviet Defence-Industry Complex from Stalin to Khrushchev (Pelgrave Macmillan, 1999) and co-editor (with Andrei Dzeniskevich) of Life and Death in Besieged Leningrad (Pelgrave Macmillan, 2004). Jonathan Wells is Professor of Anthropology and Pediatric Nutrition at UCL Great Ormond Street Institute of Child Health. He conducts research on children's body composition and energy metabolism in low- and middle-income countries, and uses an evolutionary perspective to help interpret the data and improve public health programmes. Caroline Walton is the author of several books on Russia and the USSR, including The Besieged – a story of survival, (Biteback Publishing, 2011) based on interviews with survivors of the siege of Leningrad, focusing on those involved in the arts. Her book is the tale of how creativity enabled people to survive the unsurvivable. Caroline also works as a Russian to English literary translator. She is married to a grandson of a siege survivor. Rosalind P. Blakesley is Head of the Department of History of Art and Reader in Russian and European Art, Cambridge. She is an author of six books and many articles about Russian art. Larissa Haskell, Dr John Barber, Dr Ksenia Afonina and Libby Howie – curators of the exhibition. Larissa Haskell is an art historian and a survivor of the siege of Leningrad, Dr John Barber is a historian of the Second World War on the Eastern Front, Ksenia Afonina is an independent curator and researcher into the art of World War II. Libby Howie is an independent curator with a specialist knowledge of graphic art. 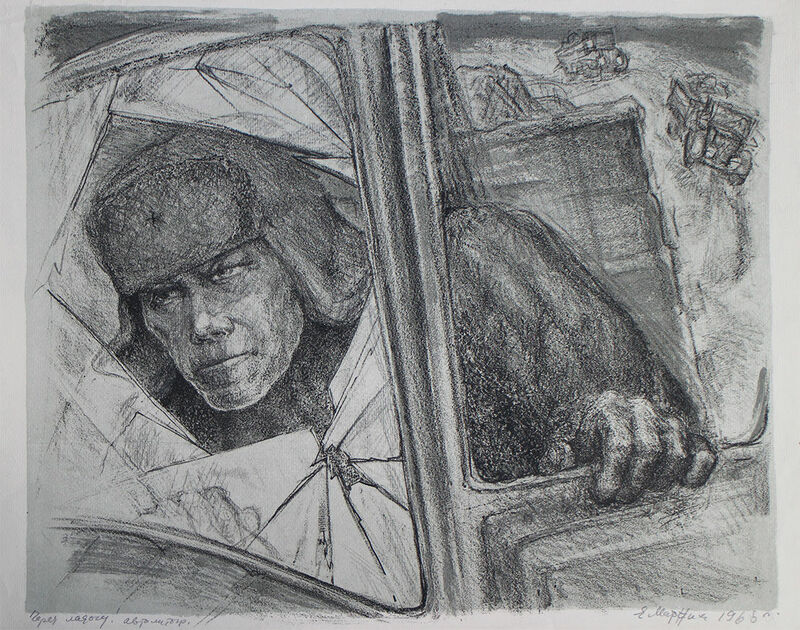 Elena Marttila: Art and Endurance in the Siege of Leningrad followed by discussion. 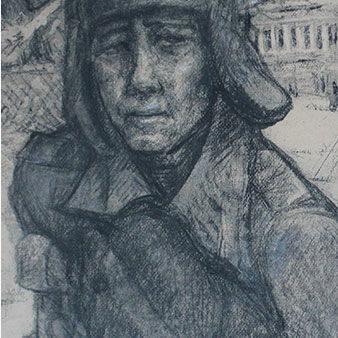 This exhibition is curated by Ksenia Afonina – an independent curator and researcher into the art of World War II and President of the Cambridge Russian-Speaking Society, and Libby Howie, an independent curator with a specialist knowledge of graphic art. This project wouldn’t be possible without Elena Marttila’s support and inspiration. We are grateful to Darwin College for their generosity in making the beautiful space of the Old Library available for this exhibition and Sotheby’s for their kind support in organisational arrangements. This project is developed in collaboration with The Cambridge Russian-Speaking Society.